Carmody Torrance Sandak & Hennessey LLP is pleased to announce that our colleague Lisa L. Feinberg has been named the Stamford Chamber of Commerce’s Member of the Year. 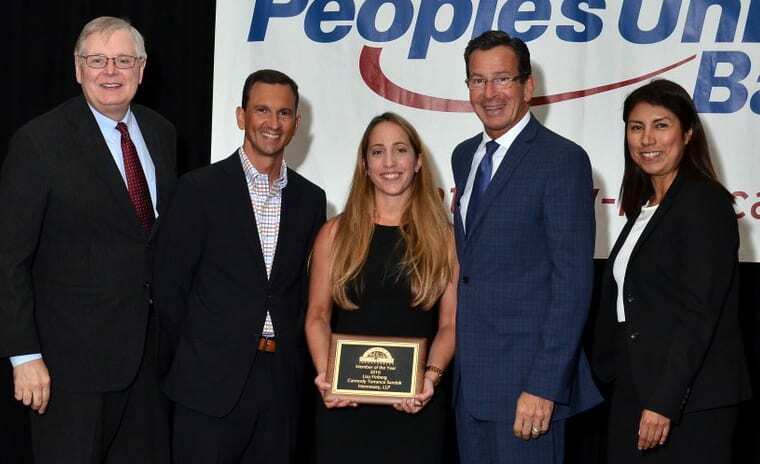 Connecticut Governor Dannel Malloy and Stamford Chamber of Commerce’s President Jack Condlin presented Lisa with the award at the Chamber’s Annual Meeting and Awards Ceremony on Thursday, September 8. The Member of the Year Award is given by the Chamber staff to the person who they feel has made the greatest contribution that year. Two years ago, Lisa joined the Young Professional’s Council and has been instrumental in growing the Council’s membership and programming. The Young Professional’s Council hosts events and programs for professionals under 40-years-old with the goal of creating a comfortable environment for meeting new people and developing lasting relationships. Lisa has helped organize large networking events, industry-specific roundtable discussions, lunch and learns, and fun social events.